What’s Trending at Coast Diamond’s Featured Realer, The Vault Fine Jewelers of Fresno, CA? When Gary and Elaine Yervan opened The Vault Fine Jewelers in 1987 they knew they had something special because their talents complemented each other. Gary’s talent as a jeweler and Elaine’s love of style and design, when put together, offer The Vault customer everything they need in one place. You will find the style you want (trend or staple) with the expertise you can count on at The Vault. 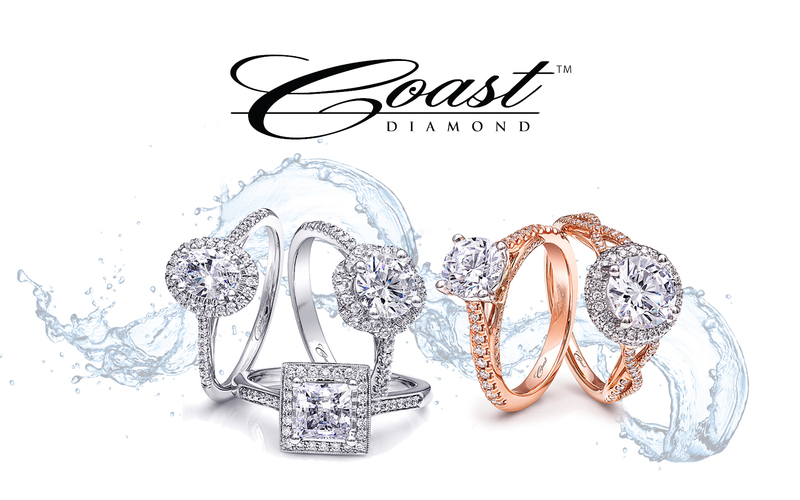 It is our pleasure to name The Vault Fine Jewelers of Fresno, CA our Coast Diamond Retailer of the Week. Trend Alert! Your stack of rings should include at least one of these Coast petite pavé set diamond wedding bands (WC5191H) with milgrain edging. Available in rose, yellow or white gold, or platinum. How do you incorporate trends in your life? Are you a walking billboard for them? Do you buy a piece or two and incorporate them into your wardrobe? Bridal jewelry trends can be tricky when it comes to engagement rings because you want to wear it forever. Today’s engagement ring trends we are highlighting from The Vault Fine Jewelers are pretty and romantic and have excellent “forever” potential. The trend of pretty bands makes our hearts go pitter patter. This Coast Diamond 1CT solitaire engagement ring (LC10186) has a diamond encrusted scalloped shank that’s truly feminine and elegant. The Vault’s brides are swooning over it. Every girl covets a decorative diamond band, or two, or three. This Coast Diamond band (WC10155H) with hexagon and square shapes is unique. It has tiny engravings on the side of the band and is finished with milgrain edging. Pair it with your Coast engagement ring. Wear it in a stack. Wear it alone. It’s versatile. The possibilities are endless with today’s engagement ring trends we see at The Vault. They are tasteful and are proving to stand the test of time. The excellent staff at The Vault Fine Jewelers are excited to help you find just what you are looking for in a Coast Diamond engagement ring, wedding band or other fine jewelry. And when you do, don’t forget to #showyourcoast. Congratulations to The Vault Fine Jewelers of Fresno, Ca for being our Coast Diamond Retailer of the Week! How do you Layer Your Coast Diamond Bands at Coast’s Featured Retailer Sissy’s Log Cabin? Layers are the hottest jewelry trend. Layering necklaces, bracelets, and rings are a fabulous and fun way to put your own unique twist on style. Layers as a bridal trend have made Coast designer Jay Gilbert’s job a lot of fun over the past couple of years. He’s had the opportunity to use his imagination and create engagement rings and diamond bands that, when layered together, tell each bride’s unique story. Sissy’s Log Cabin of Arkansas (and Tennessee) began helping brides find their unique style almost 50 years ago. Sissy loves sayings and the motto “When you’re here, everyone’s family” is supported by the wonderful staff that works tirelessly to create the family atmosphere found at Sissy’s Log Cabin. For their commitment to providing each customer a warm and exciting experience, Sissy’s Log Cabin is our Coast Diamond Retailer of the Week. Sissy’s Log Cabin not only provides a warm and inviting atmosphere to shop, but they also make it their goal to have that special piece you are looking for. If layering your diamond bands is what you want, Coast Diamond and Sissy’s Log Cabin have got you covered. How do you Layer Your Diamond Bands? The Coast classic pave diamond band (WC0890H) is the perfect foundation for the “it” girl stack. With 0.25ctw of diamonds, it is available in yellow, white and rose gold. Layering diamond band after diamond band is how the “It” girl does it. This Coast Diamond band (WC10140) has bezel and pave set diamonds in alternating shapes. Milgrain edging enhances the shine. The modern edge of this princess cut diamond makes an impact within these glistening layers. This classic Coast Diamond wedding band (WZ5001H) has 3/4 carat fishtail set diamonds halfway around the band. A classic wedding set can be “amped” up when you start adding layers. Stop into Sissy’s Log Cabin today and please remember to #showyourcoast, so we can see how you layer your Coast Diamond bands. Congratulations to Sissy’s Log Cabin of Arkansas and Tennessee for being our Coast Diamond Retailer of the Week! Chris Munn, of Munn’s Diamond Gallery, has a lot of love. He loves diamonds. He loves people. He loves learning about diamonds and people. He loves helping people learn about diamonds. He loves sharing fun facts and jewelry cleaning tips on Facebook. He loves watching someone try on a piece of jewelry and seeing the look on their face when they know it’s the one. As one customer put it, “After experiencing other jewelers, we felt 100% comfortable here, learned so much and really appreciated Chris’ kindness and patience with us!” Love is in the air at Munn’s Diamond Gallery of Central Pennsylvania and we are happy to call them our Coast Diamond Retailer of the Week. So often we hear people say, “October is my favorite month of the year.” We love the changing of the colors of the leaves. We love to throw on a sweater on a chilly day. It’s the perfect time to get engaged. Munn’s Diamond Gallery has some magnificent Coast Diamond engagement ring suggestions for your fall proposal. A sparkling statement, this spectacular Coast Diamond 1.5 ct engagement ring (LC5292) has two rows of diamonds (0.93 ctw) on the shank. That is almost 2.5 carats of diamonds on her finger to keep her warm and cozy all year long. The halo design is modernized in this enchanting Coast Diamond 1 ct halo engagement ring (LC5340) with a diamond encrusted split-shank. The sophisticated design is as timeless as your love. When love is in the air, romance is not far behind. This gorgeous Coast Diamond 1 ct solitaire engagement ring (LC5442) has pavé set diamonds on the shank of the ring, which increase in size as they approach the center stone. Pavé is French for paved. Ooh la la! Congratulations to Munn’s Diamond Gallery of Central PA for being our Coast Diamond Retailer of the Week! Make plans to attend the most exclusive designer events in Houston & Clearlake! *See Robbins Brothers website for more details. H.L. GROSS & BRO. | FALL BRIDAL EXTRAVAGANZA! Attention Garden City, NY! Mark your calendar for H.L. Gross & Bro. Jeweler’s annual Fall Bridal Extravaganza featuring Coast Diamond engagement rings and wedding bands. This fabulous event will take place on Saturday October 13th and Sunday the 14th. For more information see the link below.